Iivari opened the gate to the community pool that Green Falls had recently put in. He had never been there before and he thought it would be nice to get out. He was wearing swimming trunks and a T-shirt but he wasn't so sure he would swim. It would be nice just to read by the poolside on one of those nice reclining chairs. Luckily for him it was early in the morning and no one seemed to be there yet. He had the whole pool to himself. He sits down in one of the chairs and leans back, pulling a book out of his bag. After that big fight last night he could use some time to relax. Kaichi leans against the wall and stares at water in the pool. The night before he was hunting some spirits. They lead them to this pool. Some idiot locked the doors so he was trapped inside. The spirits managed to get away. Spending the whole night at the pool is lonely... and scary. His body shrunk to a child when the sun rise up. He grabs his big clothes and wraps around himself. It's annoying that these clothes don't shrink with his body. Though the pants still fits... somewhat. Kaichi lift his head when he heard footsteps. Does that mean the pool is open? He noticed someone with purple hair walking in. He stays idle and stare at him. Iivari doesn't seem to notice the child. He's much too absorbed in his book. He had gotten to a really good part. At this point a dolphin could jump out of the water, do a flip, and splash back into the pool and he probably wouldn't notice. It was a really good book ok? It seems like livari is too absorbed in his book. This is his chance to get away. Kaichi slowly stands up and holds his clothes tightly. He tries to move soundless to the exit. The ground is slippery so he walks slowly. Suddenly he trips over his long pants. His body falls on the ground and slide to the pool's direction. Kaichi tries to grab something on the surface but there was nothing. He falls into the pool with a loud splash. Damn...! This pool is so deep... His feet cannot touch the end. H...Help...me...! He moves his arms wild around. Water enters his mouth and nose. Is this the end...? Iivari looks up to see the young boy flailing around in the water. Without hesitating he puts the book down and runs to the pool, jumping in and grabbing the boy. He yanks the boy's head above the water and swims with him to the edge of the pool. He helps they boy up over the edge and quickly pulls himself out, helping the boy sit up. "Are you ok? Just cough it out..." Iivari was relived he was there to help. The boy would have drown if he hadn't been there. Kaichi got unconscious after his body sunk into the depth. A moment after livari saved him, he opens his eyes slowly. This emerald green eyes stares blankly on the ground. He feels a light pressure in his chest and started to cough. It suprises him that he's still alive. livari looked so focused on his book, that he thought he wouldn't notice him. Kaichi's whole body is wet and his clothes stick to it like glue. He places his tiny hand on his chest and takes a deep breath. It wasn't his first time that he almost drowned. Such a horrible experience... Another reason for hating his child-like dayform... and water. Kaichi lift his head lightly to look at livari. His wet hair covered his eyes a bit and his two hairstrands hang down like a sad kitty. He puts a soft smile on his face as a "thank you" sign. He is totally exhausted, even weak to talk. Iivari is completely entranced by the cute kitten look. Iivari wasn't the best with kids but if something was cute he was immediately involved. Iivari gently picks Kaichi up and sets him on one of the lounge chairs. He gets his towel from his bag and gently wraps it around him. "Just lie down and try to breath normally." He says. He wasn't sure what else to say. He had never been good with reassuring people, or calming them down or anything. What did you say to a young child who had almost drown? Iivari had no clue. 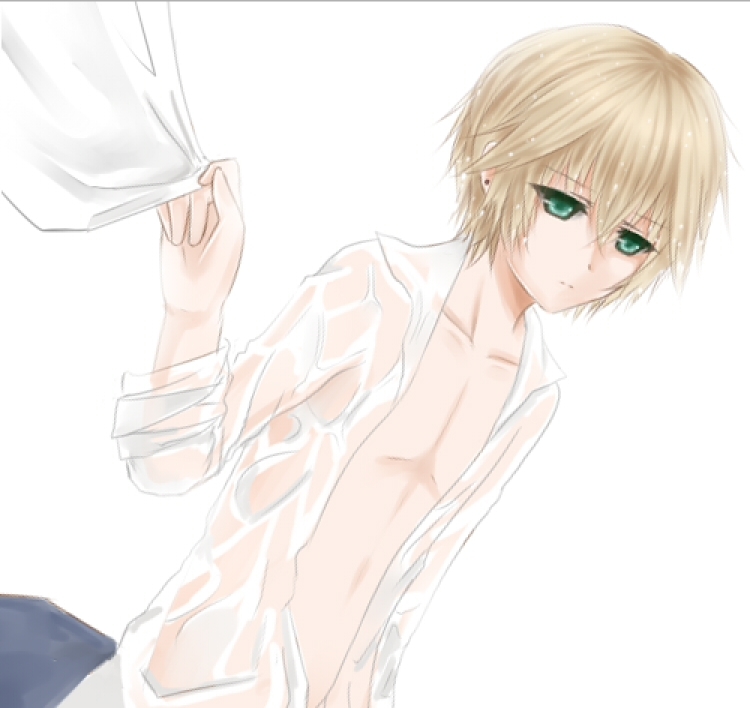 He takes his wet shirt off, but keeps his blouse and accepts the towel from livari. He won't catch a cold with this demonic body, but he doesn't like being wet. After a short moment he sits up and grabs the tip of livari's shirt. "Don't tell anyone about this accident, okay?" he whispers. His eyes stare on the ground, embarrassed to look at livari. Iivari nods. A this point he probably would have jumped off a cliff if asked too. He had zero cuteness tolerance. He couldn't help it. "I won't tell anyone." He looks around. There didn't seem to be anyone with this little boy. He looks back to Kaichi. "Are you here by yourself?" He thought it strange that anyone that young would be allowed here by himself. Surely there was an adult around to keep an eye on him? The fact that he almost drown would be a BIT of an indicator he shouldn't be at the pool alone. Kaichi sighs relieved and grins lightly. His reputation would be screwed if they find out he cannot swim. here." It seems like he doesn't recognize his child form. He tilt his head lightly and looks at him. Does he think I'm a lost child? He facepalms and look away. "You don't need to worry. There is no babysitter looking after me." he says cold, like he could read his mind. Iivari was a bit confused. Why was he so embarrassed? He also seemed surprisingly calm for almost drowning. Most children would be crying and want to go home. This one just seem concerned about no one being told about it. "Would you like me to take you home?" no tears came up. A fail... Besides it's embarrassing for a 21 years old man to cry out from nowhere. "Heh, please take me home." Actually he doesn't have a place to stay. He is always hunting souls at night in his adult form. Though, he ows a huge villa not far from the shopping center. Iivari nods and helps him up. "Where do you live?" Iivari was glad to help the young child get home safely. At least he appeared to have snapped out of whatever embarrassment he felt. "What's your phone number? I should call your parents and tell them I'm bringing you home." Iivari points over to the changing rooms. "Sure, change in there." He closes his eyes and try's to think. No parents? Who did he live with? There's no way this kid could live alone. It's not like anyone that young could have a job and make money. Kaichi goes to the changing rooms. He opens the door and looks around. It seems like no one is here. The takes the earring on his right ear off and transforms it into his dayform clothes. He quickly changes his clothes. Using his power again, he turns his nightform clothes to an earring and clips it back on his ear. He found out this methode is easier to switch clothes. Since his body is cursed, it is forced to transform between day and nighttime. With this earring, he always got his clothes ready. After he finished, he goes back to livari. Judging from his confused expression, he must be thinking something about Kaichi. "I will explain it soon" he said with a sigh. "Well, let's go." Kaichi nods to livari and head to the excit. Iivari stops in the parking lot. "I'd offer to drive you myself but it would probably be a better idea to just call you a cab." He looks over at Kaichi suspiciously. Any normal kid would be uncomfortable with a stranger driving them home. Didn't humans teach them not to get in stranger's cars from a young age? He wondered how he would react. He tilt his head to look at livari and raises an eyebrow. "I won't mind if you drive me to home. Well, if you don't have a problem with it." He doesn't worry about anything. Despite his childish appearance he is old enough to go anywhere alone. It happend a few times that he got kidnapped, but it was easy to get away. There are no human who could beat a demon, even a child demon. One time they kidnapped him when it was almost nighttime. It was hilarious to see the kidnappers' face when they got back and noticed an adult bound on chair. Kaichi grins at that thought, then he looks at livari waiting for an answer. Iivari's suspension was growing now, but he nodded. Maybe he was just a strange child. He unlocks his car and gets in the driver's seat gesturing for Kaichi to sit next to him. "You never told me. What is your name?" Kaichi climbs into the car tries to sit comfortable. His feet couldn't reach the ground. Ugh... annoying. He looks at livari when he questioned him. He wonder if he ever told his name in nightform. I guess not...? Then it won't be a problem. "My name is Kaichi. What about you?" "My name is Iivari." Somehow this kid's name sounded familiar. Did he know him from somewhere? "Have you ever been to the Library Kaichi?" He asks. If he had been to the library that could explain why he seemed so familiar. "Nice to meet you livari" he says politely. So this library guy is called livari. "Yes I often go to the library. I saw you before behind the desk. Do you remember you let me borrow a book? ((OOC: event happend at Library -> Stranger's Gift)) He sighs relieves. It seems like livari doesn't have connected him with his nightform. It's funny that some people does know his nightform but not his dayform, or opposite. Hopefully it won't cause problems... Kaichi leans on his arm and stare out the window. It is still morning. No much time had passed by since he got out the pool. Hopefully I never have to see the pool again. "I've let lots of people borrow books." He didn't remember letting Kaichi check out a book but with all the people coming in and out of the library that didn't mean much. "What book did you check out?" Maybe he could remember him by what he checked out. "Hmm... that's true." he mumbles and swings his legs playful. "What book it was..." He blinks and tries to remind what he took from the library. He had read many books there, but only a few had useful information. "Something about Japanese urban legends." It isn't something that a child would like to read, but he is mentally an adult. He doesn't come to the library to read fairy tales. Iivari was now extremely suspicious. This kid didn't think like a kid and it was extremely unlikely he was a genius. So what was he? Was it some kind of disguise or something? Iivari pulls up to the place Kaichi had told him. Nobody was outside waiting for him. No worried guardian came rushing out the door to greet their missing child. "Kaichi, do you live all by yourself?"